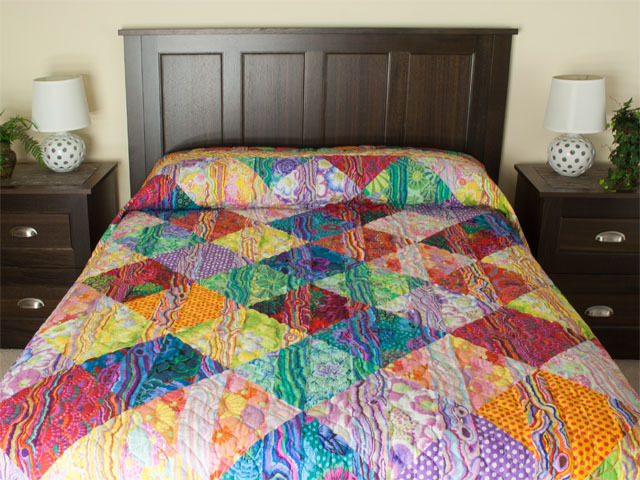 Log Cabin Simplicity - Queen quilt using Designer Kaffee Fassett's fabrics!! 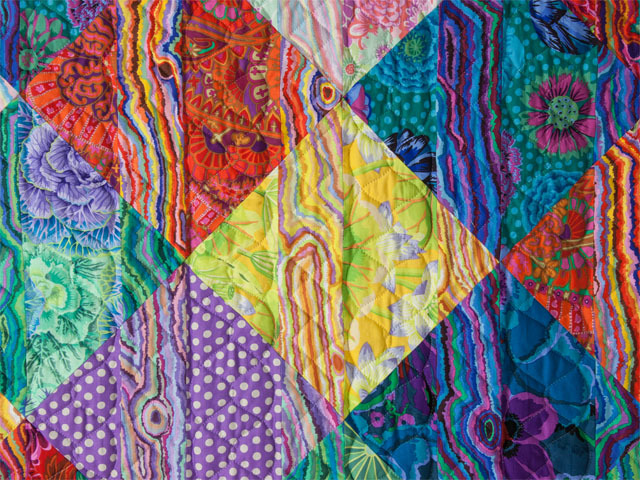 If you have never heard of fabric designer Kaffe Fassett, here is a good look at his brilliant fabric designs. Google his life and check out his story and his fabric career. 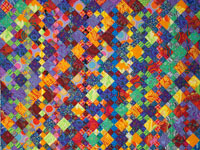 This quilt is made from a kit of fabrics he assembled. Notice the funky coordinated stripes between each large floral or dotted fabric making up the large squares. And do not forget to check out the beautiful hand quilting on the patches. 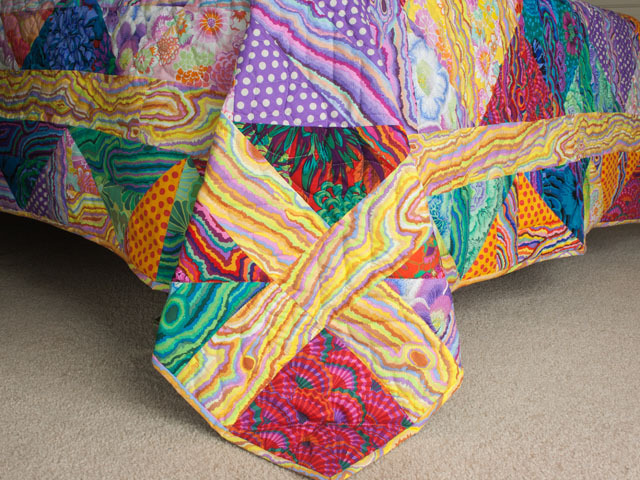 It has columns of two different quilting designs hiding in the lively prints. Look closely for the hand quilted designs. This fabric is 100% cotton and I have never felt softer fabrics. We do not know how he does it but Kaffe Fassett fabrics have a different feel about them. You will love the soft feel of his fabric lines. 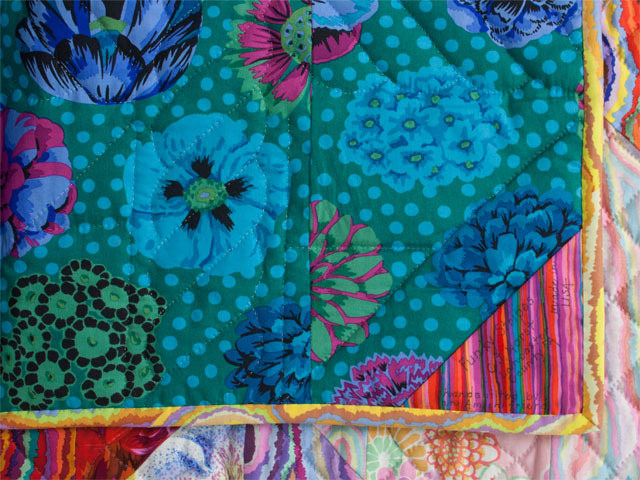 The backing of the quilt has two prints - a modern look too -- it has a coordinating stripe of teal fabric with similar colors to the backing shown. 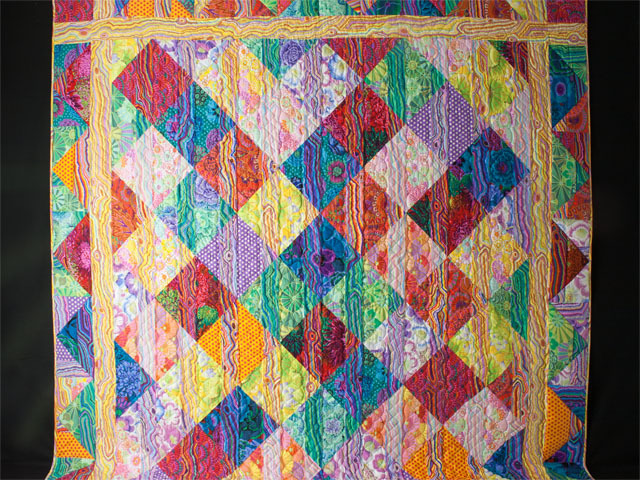 It runs down through the middle of the quilt giving it that carefree contemporary look when it is reversed. The corner tag documents that it was made in Lancaster County, Pa - Quilt capital of the world. 100% cotton fabrics. The hand quilting is very well done at 8 hand stitches per inch. Excellent for your collection. I'm anxious to see you orders this one!! It is a one of a kind and fabrics can not be repeated. An extra special gem of colors. A high quality quilt. 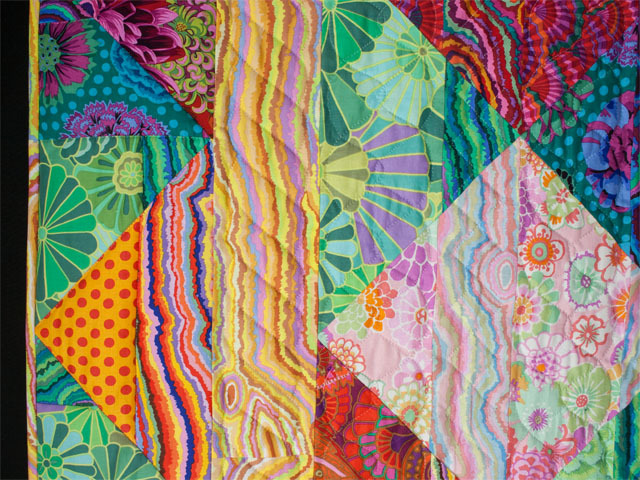 The Diagonal Madness Quilt pattern by Kaffe Fassett makes great use of his colorful prints. Here C Jean Horst has used Kaffe's ideas and made a scrappy quilt. I love the scrappiness of it and the strong diagonals that emerge while maintaining rippling vertical stripes, yet another amazing use of simple squares. 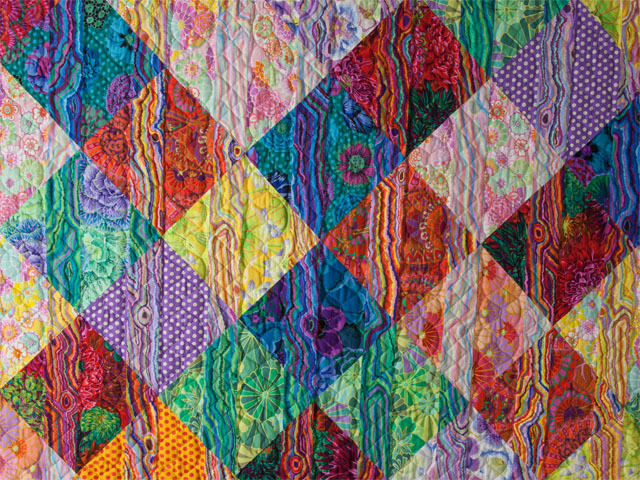 And if you've ever touched a Kaffe Fassett quilt, you will notice the extra softness that his fabrics give -- to feel his fabrics is a treat in itself. They are also so beautiful to work with and so inspiring to look at. 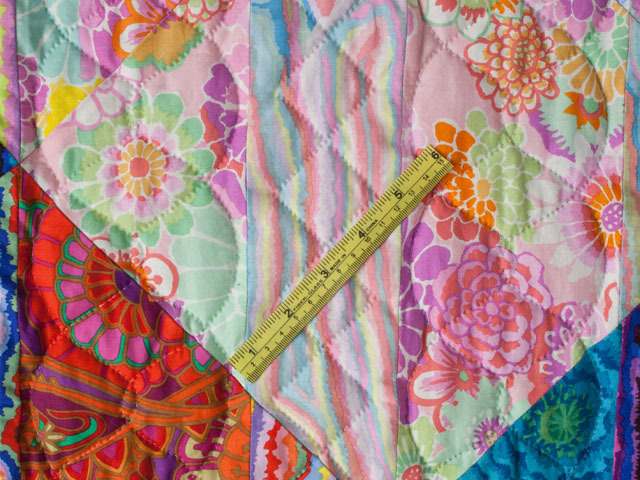 Our Amish hand quilter was able to hand quilt 8 tiny stitches per inch on this fine quilt.